The 2016 Major League Baseball draft, Day Three, is about to kick off. Today will include Rounds 11-40 and will be updated throughout the day as the Cincinnati Reds make each pick with as much information as I’m able to track down. It’s going to be hectic, and with 30 rounds it’s tougher to keep up with than yesterday. The picks will be added quickly and I will do my best to update things throughout the day. There will be three different articles today, one for each set of 10 rounds on the final day. If you’re looking for all kinds of information on the draft, you can check out all of the draft coverage we’ve provided here. Day three of the draft is one of the most visited days of the year for the site. 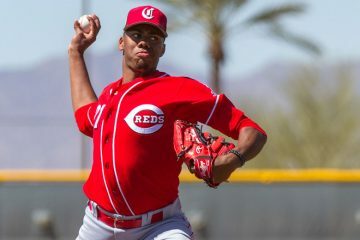 That makes this the best place to remind you that you can help support all of the hard work here at the site by sending a small donation or by subscribing to the site for $4 a month and getting access to a few additional articles each month that are chock full of scouting reports on Reds prospects. The Reds stick with their pitching theme to start out day three of the draft by selecting a big right hander. Joel Kuhnel is listed at 6′ 5″ and 260 lbs. He has pitched the past two seasons at Texas-Arlington after spending his freshman year at Central Arizona Community College. He’s got a good fastball that works in the 91-95 MPH range and has hit 97 MPH. At the lower end of that the pitch shows very good sinking action. He also throws a cutter and a slider that are average offerings. He does have a change up but it’s a well below-average offering at this point. Kuhnel dealt with a shoulder issue that cost him several weeks without pitching this spring, but he returned and gave scouts a look before the draft. 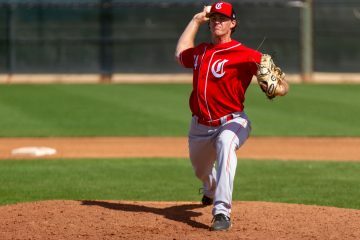 Sticking with the college theme, the Cincinnati Reds took catcher Cassidy Brown from Loyola Marymount. For the first two years of his college career it was his defense that kept him playing on a semi-regular basis, but he never showed much of anything with the bat. His junior season, the Columbus, Ohio native put things together at the plate as he took big strides across the board. An adjustment at the plate with his swing mechanics helped the 6′ 3″ and 215 lb. catcher tap into his power and generally just hit the ball harder and it took his batting line to a different level. He’s got a plus arm behind the plate and is athletic back there. He will need to continue to work on the finer parts of catching though. Ryan Olson began his career at San Diego but transferred to Cal Poly Pomona for his sophomore and junior seasons. He had a strong season in 2015 and was out to a strong start in 2016, but last pitched in March after suffering an injury (unknown at this point). The Reds took Boston College senior left hander Jesse Adams with their 14th round selection. The left spent time in the rotation in the last two years, making 15 total starts and another 25 relief appearances. In his first two seasons he made 42 appearances, all from the bullpen. Looking at the stats, his senior year was a step backwards, particularly when it came to his ability to control the strikezone as his walk rate jumped up and his strikeout rate dropped off. He throws his fastball in the upper 80’s and also mixes in a curveball and a change up. Jesse Stallings got his career started by redshirting at LSU his freshman year after undergoing Tommy John surgery in high school. He pitched well at LSU in 2015 but did take a step backwards in 2016 as his control backed up and his strikeout rate dropped off. His fastball generally works in the 92-94 range and has touched 97 MPH. He throws both a slider and a curveball to go along with a change up. The Cincinnati Reds took an outfielder in the 16th round by selecting high schooler Mauro Conde out of Puerto Rico. He’s an average to slightly above-average runner who shows solid power potential thanks to his size and good bat speed. His pitch recognition skills are said to stand out. He spent time on the mound in high school as well. Health has been the biggest issue for Mitchell Traver in his time at TCU. He had surgery to remove a rib in his freshman year. He also underwent Tommy John surgery and missed a season. He also missed another season, sans 0.1 innings, with a back injury. He also missed part of another season with a back injury. He’s an imposing guy, coming in at 6′ 7″ and 250 lbs. He’s got stuff that matches up with that size, working with his fastball in the 91-94 range and touching 97 MPH as a starter with good movement. He also brings an above-average slider to the table with plus potential. His change up has improved but it’s a clear third offering for him. He was selected by the St. Louis Cardinals in the 28th round last year but turned them down and returned to school. This could be where some of the money saved on several senior picks in the Top 10 go as J.C. Flowers was ranked as the #142 prosepct by Baseball America coming into the draft. He split time between football and baseball while in high school at Trinity Christian Academy in Florida. He’s got above-average speed that plays well in center field. He also has a very strong arm – as a pitcher he could touch 95 MPH. He’s considered to be raw, but incredibly athletic. At the plate there’s some power potential to tap into, but most teams seemed to prefer him as a pitcher. 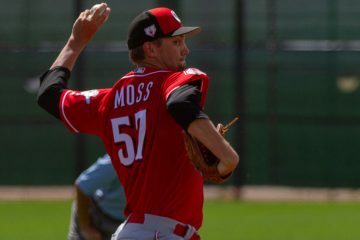 Perhaps the Reds will let him try to hit at first, which he seems to prefer, and if that doesn’t work try to move him to the mound where he’s got plenty of potential. The Cincinnati Reds previously drafted Matt Blandino, taking him out of high school in the 2013 draft in the 33rd round. He’s bounced around since then, pitching at Central Connecticut State University in 2014 and 2015 before transferring to Felician College for the 2016 season. He performed well for Felician College last year, posting a 2.32 ERA with a very strong walk rate to go with a quality strikeout rate. The competition level wasn’t high, but he performed quite well. Baseball America had him ranked as the 27th best prospect from the state of New Jersey this season. He was the CACC Pitcher of the Year in 2016. For the second time in three rounds the Reds went to Trinitiy Christian Academy in Florida to pick an outfielder. This time they took Todd Lott, a 6′ 4″ and 205 lb right fielder. He was ranked as the #353 prospect in the draft by Baseball America. The biggest selling point for Lott is that he’s got a bunch of power and potential plus power in the future to tap into. He’s a below-average runner, so he may have to slide to left field in the future if he loses any more speed as he matures. His arm will play in right field, but it won’t stand out. Kind of bummed to see the Reds didn’t take any top ranked HS guys in the 11th. Clearly the Reds didn’t plan any extra bonus money to buy out some of these high talents out of college. Looks like the savings they got will be used to buy out the high school players Trammell, Hanson, and Mondile. I guess we will have to see what the bonus pool signings on the overslots and underslots by mid July. Phillies Josh Stephens OF – ranked 115. Brewers Chad McClanahan 3B – ranked 136. Padres Trevyne Carter OF – ranked 152. Red Sox Nick Quintana SS – ranked 114. 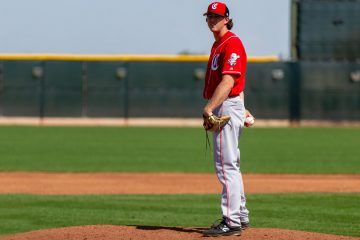 Twins Tyler Benninghof RHP – ranked 201. Cassidy Brown C was ranked 216. Joel Kuhnel RHP was ranked 247. Hard to care too much about anything right now, but I really question the Reds’ mindset right now. Like Alex said, maybe they just need more money than we thought for the top 10 round HSers. NOW THERE’S A PICK I CAN GET ON BOARD WITH. Conde sure sounds intriguing from that description. Saw JC Flowers at the Florida HS all star game. He has a great physical appearance. He also showed a ton of power in Bp. explosive. Either the Reds will need their pool space to sign the guys they took in the top 10 rounds, or they are going to try to get a lot of the high school players they choose 11-40 and not just one big one. Don’t get down because they didn’t draft a name you were told to care about.